Plant WRKY DNA-binding transcription factors are involved in plant responses to biotic and abiotic responses. It has been previously shown that Arabidopsis WRKY3 and WRKY4, which encode two structurally similar WRKY transcription factors, are induced by pathogen infection and salicylic acid (SA). However, the role of the two WRKY transcription factors in plant disease resistance has not been directly analyzed. Both WRKY3 and WRKY4 are nuclear-localized and specifically recognize the TTGACC W-box sequences in vitro. Expression of WRKY3 and WRKY4 was induced rapidly by stress conditions generated by liquid infiltration or spraying. Stress-induced expression of WRKY4 was further elevated by pathogen infection and SA treatment. To determine directly their role in plant disease resistance, we have isolated T-DNA insertion mutants and generated transgenic overexpression lines for WRKY3 and WRKY4. Both the loss-of-function mutants and transgenic overexpression lines were examined for responses to the biotrophic bacterial pathogen Pseudomonas syringae and the necrotrophic fungal pathogen Botrytis cinerea. The wrky3 and wrky4 single and double mutants exhibited more severe disease symptoms and support higher fungal growth than wild-type plants after Botrytis infection. 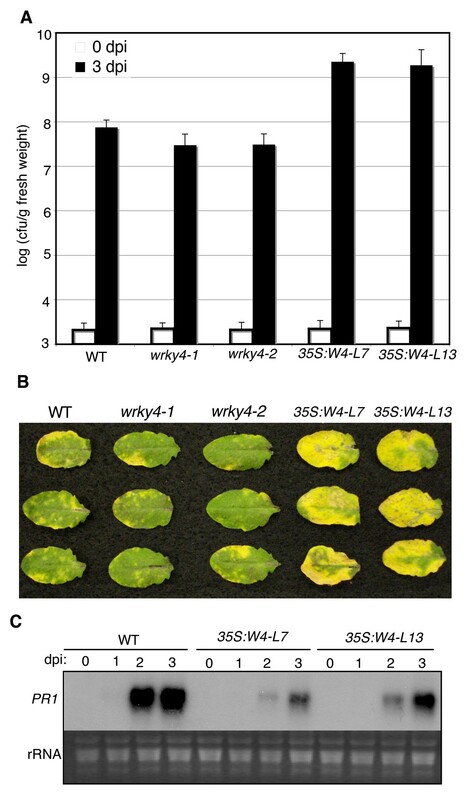 Although disruption of WRKY3 and WRKY4 did not have a major effect on plant response to P. syringae, overexpression of WRKY4 greatly enhanced plant susceptibility to the bacterial pathogen and suppressed pathogen-induced PR1 gene expression. The nuclear localization and sequence-specific DNA-binding activity support that WRKY3 and WRKY4 function as transcription factors. Functional analysis based on T-DNA insertion mutants and transgenic overexpression lines indicates that WRKY3 and WRKY4 have a positive role in plant resistance to necrotrophic pathogens and WRKY4 has a negative effect on plant resistance to biotrophic pathogens. Upon pathogen infection, pathogen-associated molecular patterns (PAMPs) such as bacterial flagellin and lipopolysaccharides are recognized by plant receptors to activate PAMP-triggered immunity through a mitogen-activated protein kinase signaling cascade . Gram-negative bacterial pathogens such as Pseudomonas syringae can deliver effector proteins to plant cells to interfere PAMP-triggered resistance to promote pathogen virulence. As a result, the remaining basal defense is usually insufficient to contain pathogens but can limit their growth in plant tissue. Through co-evolution, some effectors may be specifically recognized by plant resistance (R) proteins and activate strong effector-triggered immunity (ETI) . R gene-activated ETI involves a complex defense program including production of reactive oxygen species (ROS) and salicylic acid (SA), rapid programmed cell death (hypersensitive responses, HR) and induction of a large number of host genes including pathogenesis-related (PR) genes . In Arabidopsis, R gene- and SA-mediated defense mechanisms are effective against biotrophic pathogens that feed on living host tissue during the whole or part of their infection cycle [2, 3]. Necrotrophic pathogens kill the host to extract nutrients. Many necrotrophic pathogens produce toxins, cell wall-degrading enzymes and ROS to promote disease and macerate plant tissue . Plant defense mechanisms against necrotrophic pathogens have been analyzed relatively recently and appear to differ from those against biotrophic pathogens in important ways. First, gene-for-gene resistance is common to biotrophic pathogens but not to necrotrophic pathogens. Second, R gene-mediated HR is effective against biotrophic pathogens but does not deter and in some cases actually facilitate infection of necrotrophic pathogens . Third, while SA is important for resistance to biotrophic pathogens, its role in defense against necrotrophic pathogens is limited, if any. In Arabidopsis, mutations that impair SA biosynthesis or signaling do not affect resistance to Botrytis [6, 7]. Abolishing SA accumulation in transgenic nahG plants resulted in limited increase in susceptibility to Botrytis . However, transgenic nahG plants have nonspecific phenotypes (i.g. reduced phytoalexin) independent of SA [8, 9] and the enhanced susceptibility to Botrytis observed in transgenic nahG plants may not be caused by SA deficiency. Although discovered relatively recently, WRKY transcription factors are becoming one of the best-characterized classes of plant transcription factors and are at the forefront of research on plant defense responses . Pathogen infection or treatment with pathogen elicitors or SA induces rapid expression of plant WRKY genes. We have shown that in Arabidopsis, for example, expression of 49 out of 72 tested WRKY genes was differentially regulated after pathogen infection or SA treatment . In addition, a large number of defense or defense-related genes, including well-studied PR genes and the regulatory NPR1 gene, contain W-box elements in their promoters that are specifically recognized by WRKY proteins and are necessary for their inducible expression [12–18]. More recent studies have provided direct evidence for the involvement of specific WRKY proteins in plant defense responses. For example, mutations of Arabidopsis WRKY70 enhance plant susceptibility to both biotrophic and necrotrophic pathogens including the bacterial pathogen Erwinia carotovora as well as fungal pathogens Erysiphe cichoracearum and Botrytis [19–21]. In addition, wrky70 mutants are compromised in both basal and R-gene (RPP4)-mediated resistance to the oomycete Hyaloperonospora parasitica . Arabidopsis wrky33 mutants are highly susceptible to necrotrophic pathogens but respond normally to biotrophic pathogens . These results indicate that WRKY33 plays an important and specific role in plant resistance to necrotrophic pathogens. Other WRKY proteins can function as negative regulators of plant disease resistance. For example, mutations of Arabidopsis WRKY7, WRKY11 and WRKY17 enhance plant resistance to virulent P. syringae strains [24–26] and mutations of Arabidopsis WRKY25 enhance tolerance to P. syringae . The structurally related WRKY18, WRKY40 and WRKY60 function partially redundantly as negative regulators in plant resistance to P. syringae and E. orontii [28, 29]. Their barley homologues HvWRKY1 and HvWRKY2 also function as suppressors of basal defense . The diverse roles of WRKY proteins may reflect the complex signaling and transcriptional networks of plant defense that require tight regulation and fine-tuning. We have previously shown that infection of an avirulent P. syringae strain or SA treatment induces Arabidopsis WRKY3 and WRKY4, which encode two structurally closely related WRKY proteins . In the present study, we have shown that both WRKY3 and WRKY4 are nuclear-localized sequence-specific DNA-binding proteins. We have also shown that induced expression of WRKY3 and WRKY4 after pathogen infection or SA treatment was primarily due to plant stress caused by infiltration and spraying of pathogen suspension or SA solution. Both loss-of-function T-DNA insertion mutants and transgenic overexpression lines for WRKY3 and WRKY4 have been generated and examined for responses to the biotrophic bacterial pathogen P. syringae and the necrotrophic fungal pathogen B. cinerea. These studies strongly suggested that WRKY3 and WRKY4 play a positive role in plant resistance to necrotrophic pathogens but a negative role in resistance to biotrophic pathogens. Based on the number and structure of the WRKY zinc fingers, WRKY proteins are classified into three groups . The first group contains two zinc-finger motifs while the second and third groups contain only one zinc-finger motif. The Cys2HisCys zinc finger in the third group of WRKY proteins is slightly different from the more common Cys2His2 zinc finger found in the first and second groups of WRKY proteins. WRKY3 and WRKY4 belong to group I WRKY proteins each with two Cys2His2 motifs (Figure 1). For group I WRKY proteins, the C-terminal WRKY zinc finger is responsible for sequence-specific DNA binding [31, 32]. The NMR solution structure of the C-terminal DNA-binding WRKY zinc finger of the Arabidopsis WRKY4 protein consists of a four-stranded β-sheet, with a zinc binding pocket formed by the conserved Cys2His2 residues located at one end of the β-sheet to form a novel zinc and DNA binding structure . Besides the conserved WRKY domains, WRKY3 and WRKY4 share high levels of similarity throughout their whole protein sequences (Figure 1). WRKY3 and WRKY4 sequences and alignment. Amino acid residues identical between the two proteins are blue. The highly conserved WRKYGQK sequences and the residues forming the C2H2 zinc-fingers are red. Most characterized WRKY transcription factors recognize the TTGACC/T W-box sequences [12, 15, 34]. To examine the DNA-binding activity of WRKY3 and WRKY4, we expressed the genes in E. coli, purified the recombinant proteins, and assayed their binding to an oligonucleotide containing two direct TTGACC W-box repeats (Pchn0; Figure 2A) using electrophoretic mobility shifting assays (EMSA). 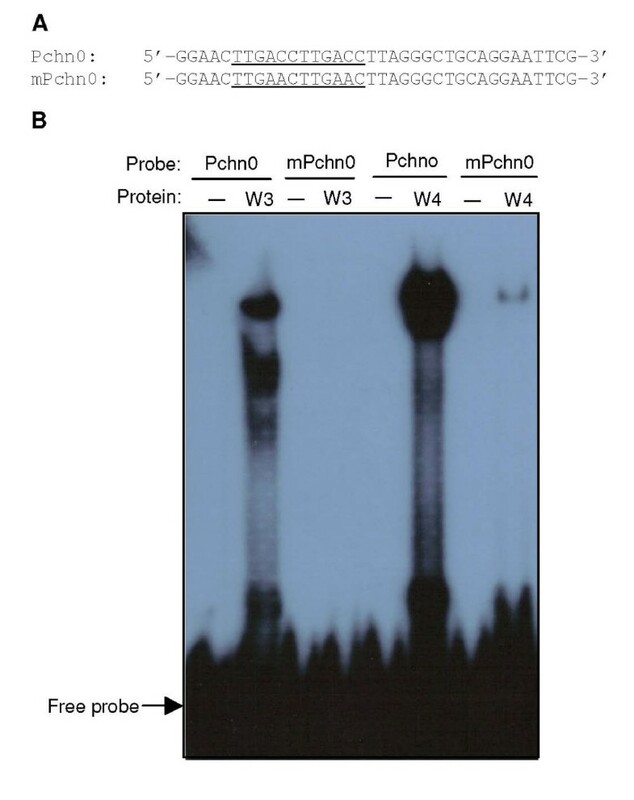 Protein/DNA complexes with reduced mobility were detected when purified recombinant WRKY3 or WRKY4 protein was incubated with the Pchn0 probe (Figure 2B). Binding to a mutant probe (mPchn0) in which the TTGACC sequence was changed to TTGAAC was undetectable for WRKY3 and greatly reduced for WRKY4 (Figure 2B). Thus, binding of WRKY3 and WRKY4 to the TTGACC W-box sequence is highly specific. DNA binding activity of WRKY3 and WRKY4. A. Sequences of oligonucleotide probes. The Pchn0 probe contains two TTGACC W boxes, while in the mPchn0 probe, the TTGACC sequences are mutated to TTGAAC. The wild-type and mutated W-box sequences are underlined. 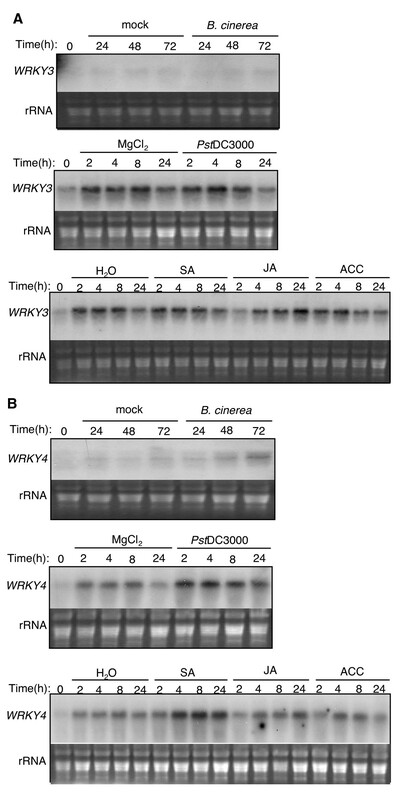 B. Electrophoretic mobility shift assay (EMSA) of DNA binding of the WRKY3 and WRKY4 recombinant proteins. To determine the subcellular location of WRKY3 and WRKY4, we constructed GFP protein fusions of the two WRKY proteins at C terminal. The fusion constructs, driven by the CaMV 35S promoter, were directly bombarded into onion (Allium cepa) epidermal cells. The transiently expressed WRKY3-GFP and WRKY4-GFP fusion proteins were localized exclusively to the nucleus (Figure 3). By contrast, GFP was found in both the nucleus and cytoplasm (Figure 3). Subcellular localization of WRKY3 and WRKY4. WRKY3 and WRKY4 were fused to GFP to yield WRKY3::GFP and WRKY4::GFP, respectively; the chimeric proteins were localized to the nucleus of onion epidermal cells. GFP alone was detected in both the nucleus and the cytoplasm due to its small size. Bright-field image of the onion epidermal cells are shown in the top panels. To analyze the role of WRKY3 and WRKY4 in plant defense, we analyzed their expression after pathogen infection. Both mock (1% maltose only) and Botrytis infection resulted in a significant increase in the level of WRKY3 transcripts (Figure 4A). We also investigated its expression after infiltration with a control MgCl2 solution (mock inoculation) or a suspension of the virulent P. syringae pv. tomato strain DC3000 (PstDC3000). As shown in Figure 4A, in plants infiltrated with MgCl2 or the bacterial suspension, the levels of WRKY3 transcripts were elevated at 2, 4, 8 and, to a lesser extent, 24 hours post infiltration (hpi) relative to that at 0 hpi (Figure 4A). WRKY3 transcripts were also rapidly elevated to similar levels after spraying with H2O, defense-inducing molecules SA, methyl jasmonic acid (JA) or 1-aminocyclopropane-1-carboxylic acid (ACC), the immediate precursor of ethylene (ET) biosynthesis (Figure 4B). Thus WRKY3 responded rapidly to stress conditions generated by liquid infiltration or spraying. Induced expression of WRKY3 and WRKY4. Five-week-old Arabidopsis plants (Col-0) were sprayed with either 1% maltose (mock) or Botrytis, infiltrated with 10 mM MgCl2 or PstDC3000 (OD600 = 0.0001 in 10 mM MgCl2) or sprayed with H2O, SA (1 mM), methylJA (100 μM) or ACC (2 mM). The infiltrated or sprayed leaves were collected at indicated times after treatment for RNA isolation. RNA gel blot analysis was performed with a 32P-labeled probe for WRKY3 (A) or WRKY4 (B). The experiments were repeated two times with similar results. The expression of WRKY4 was responsive to both mock and Botrytis infection but at 48 and particularly 72 hpi, the levels of WRKY4 transcripts were higher in Botrytis-infected plants than those in mock-infected plants (Figure 4B). WRKY4 was also rapidly induced by infiltrated with either the MgCl2 solution or the bacterial suspension. However, in the three RNA blotting experiments performed, WRKY4 transcripts were consistently higher in pathogen-infiltrated plants than those in MgCl2-infiltrated plants (Figure 4B). Furthermore, the transcript levels of WRKY4 were consistently higher in SA-treated plants than those in H2O- JA- or ACC-sprayed plants. Thus, stress-induced expression of WRKY4 was further elevated by pathogen infection and SA treatment. To determine the role of WRKY3 and WRKY4 directly, we identified two independent T-DNA insertion mutants for both WRKY3 and WRKY4. The wrky3-1 mutant (Salk_107019) contains a T-DNA insertion in the second exon while wrky3-2 (Salk_119051) contains a T-DNA insertion in the first exon of the WRKY3 gene (Figure 5A). The wrky4-1 (Salk_082016) and wrky4-2 (Salk_073118) mutants both contain a T-DNA insertion in the first exon of the WRKY4 gene (Figure 5A). Homozygous mutant plants were identified by PCR with WRKY3- or WRKY4-specific primers. Northern blotting analysis showed that WRKY3 or WRKY4 transcripts in the respective homozygous mutants were greatly reduced after SA treatment (Figure 5B). To determine possible functional redundancy, we also generated wrky3-1/wrky4-1 and wrky3-2/wrky4-2 double mutants through genetic crossing. The wrky3 and wrky4 single and double mutants show no difference in growth, development or morphology from wild-type plants. The wrky3 and wrky4 single and double mutants also responded normally to the virulent PstDC3000 strain based on the growth of the bacterial pathogen. However, in two of the four experiments, wrky4 single mutant and wrky3/wrky4 double mutant plants developed significantly less chlorotic disease symptoms than wild-type plants after PstDC3000 infection, suggesting that WRKY4 may play a negative role in plant tolerance to the bacterial pathogen. Generation of T-DNA knockout and overexpression lines. (A) Diagram of WRKY3 and WRKY4 and their T-DNA insertion mutants. (B) RNA gel blot analysis of wrky3 and wrky4 mutants. Wild-type and mutant plants were sprayed with SA (1 mM). The leaves were harvested 4 hours after treatment for total RNA isolation. After separation on the gels and blotting to nylon membranes, the blots were probed with corresponding gene-specific DNA fragments. 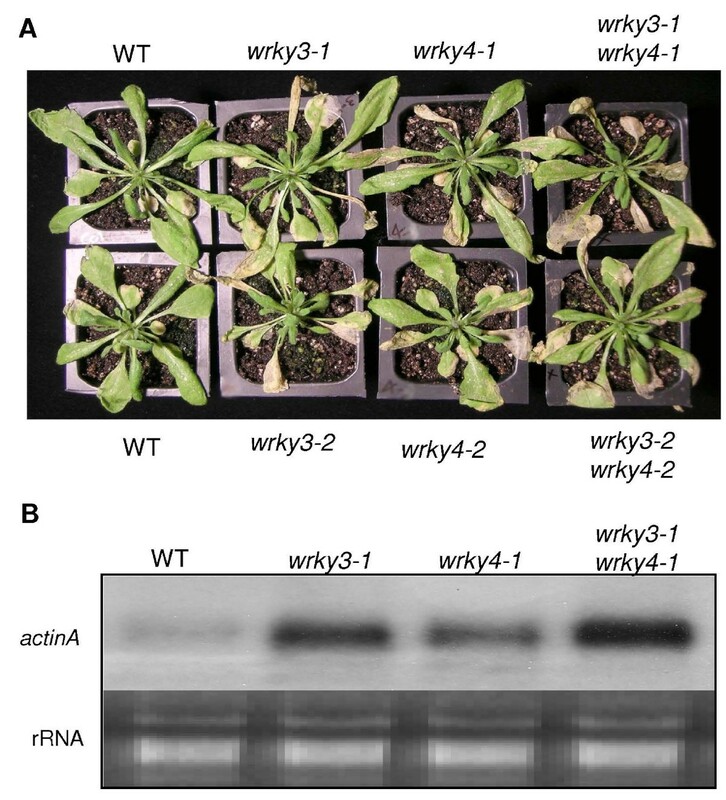 (C) WRKY3 and WRKY4 expression in transgenic plants. RNA samples were prepared from leaves of 5-week-old wild-type (Col-0) and transgenic plants and probed with a WRKY3- or WRKY4-specific probe. Transgenic WRKY3 lines 3 and 8 and transgenic WRKY4 lines 7 and 13 contained a single T-DNA insertion in the genome and exhibited stable expression of their respective transgenes. Their F3 homozygous progeny plants were used in all the experiments in the study. To determine the role of WRKY3 and WRKY4 in plant resistance to a necrotrophic pathogen, we analyzed disease development caused by the infection of B. cinerea in the wrky3 and wrky4 mutant plants and compared it with that in wild-type plants. As shown in Figure 6A, the wrky3 and wrky4 single and double mutant plants developed more severe disease symptoms than wild-type plants. To quantify the fungal growth in these plants, we performed northern blotting of total RNA isolated from these plants using an actin gene from B. cinerea as probe. Like disease symptoms, accumulation of the transcript of the fungal gene was significantly elevated in the wrky3 and wrky4 single and double mutant plants (Figure 6B). These results suggest that WRKY3 and WRKY4 play a positive role in Arabidopsis resistance to the necrotrophic fungal pathogen. Analysis of mutants to Botrytis. (A) Col-0 wild type (WT), wrky3 and wrky4 single and double mutant plants were inoculated by spraying spore suspension at a density of 5 × 105 spores/ml and kept at high humidity. The pictures of representative plants were taken 5 days after the inoculation. (B) The total RNA isolated from the plants 5 days after inoculation was probed with a Botrytis actinA gene probe to determine the biomass of the fungal pathogen on infected plants. The experiments were repeated three additional times with similar results. To further examine the roles of WRKY3 and WRKY4, we generated transgenic Arabidopsis plants that constitutively overexpress the WRKY genes. Constructs containing a full-length WRKY3 or WRKY4 cDNA driven by the CaMV 35S promoter were generated and transformed into Arabidopsis (Col-0 ecotype). Northern blotting identified several transgenic plants that contained elevated levels of WRKY3 transcripts even in the absence of SA treatment (Figure 3A). However, WRKY3 transcripts in the transgenic plants exhibited smear patterns on the RNA blot (Figure 5C), which could result from premature termination of transcription, alternative splicing and/or degradation of WRKY3 transcripts. Transgenic WRKY4-overexpressing lines were also identified, and WRKY4 transcripts in the overexpression lines were predominantly in a single band of expected size on the RNA blot (Figure 5C). The transgenic overexpression lines for WRKY3 and WRKY4 show no visible alteration in growth, development or morphology from wild-type plants. To determine possible changes of the overexpression lines in plant disease resistance, we first examined their responses to B. cinerea but found no significant difference in resistance to the fungal pathogen when compared to that of wild-type plants (data not shown). We then inoculated them with PstDC3000 and monitored both bacterial growth and disease symptom development. We observed no significant difference between the WRKY3-overexpressing lines and wild-type plant in both disease symptom development and the growth of the bacterial pathogen. However, following inoculation with PstDC3000, the transgenic WRKY4 overexpression lines displayed approximately 25–30 fold greater bacterial growth than wild-type plants (Figure 7A). The inoculated leaves of WRKY4-overexpressing plants also developed much more severe disease symptoms than those of wild-type plants after infection (Figure 7B). Thus overexpression of WRKY4 greatly enhanced plant susceptibility to the bacterial pathogen. Responses of wrky4 mutants and transgenic WRKY4 -overexpressing plants to Pst DC3000. (A) Altered bacterial growth in the WRKY mutants. Wild type (WT), wrky4 mutants and WRKY4-overexpressing lines 7 and 13 (35S:W4-L7 and 35S:W4-L13) were infiltrated with a suspension of PstDC3000 (OD600 = 0.0001 in 10 mM MgCl2). Samples were taken at 0 (open bars) or 3 days (closed bars) post inoculation (dpi) to determine the growth of the bacterial pathogen. The means and standard errors colony-forming units (cfu) were calculated from 10 plants for each treatment. (B) Disease symptom development. Pathogen inoculation of wild type, mutants and overexpression lines was performed as in A. Pictures of representative inoculated leaves taken at 4 dpi. (C) Pathogen-induced PR1 expression. Wild type and WRKY4-overexpressing plants were infiltrated with a suspension of PstDC3000 (OD600 = 0.0001 in 10 mM MgCl2). Inoculated leaves were collected at indicated dpi for RNA isolation. RNA gel blot analysis was performed with 32P-labeled PR1. These experiments were repeated three times with similar results. SA-mediated defense plays a critical role in plant defense against P. syringae [35, 36]. SA-mediated defense mechanisms are associated with expression of PR genes including PR1 that is often used as a reliable molecular marker for SA-dependent systemic acquired resistance . Since WRKY4-overexpressing plants had higher susceptibility than wild-type plants to P. syringae, we compared the transgenic plants with wild-type plants for pathogen-induced expression of PR1. These analyses revealed no significant PR1 transcript accumulation in buffer-treated wild type or WRKY4-overexpressing plants (Figure 7C). PR1 transcripts accumulated to high levels in wild-type plants at both 2 and 3 day after inoculation (dpi) (Figure 7C). In the WRKY4-overexpressing plants, however, accumulation of PR1 transcripts was substantially reduced at both 2 and 3 dpi when compared to that in wild-type plants (Figure 7C). The reduced PR1 expression in the WRKY4-overexpressing plants is consistent with reduced resistance of the overexpression plants to the bacterial pathogen. WRKY3 and WRKY4 encode two structurally similar WRKY proteins (Figure 4) and their expression was both responsive to stress conditions (Figure 4). Stress-induced expression of WRKY4 but not WRKY3 was further enhanced by pathogen infection or SA treatment (Figure 4). Independent T-DNA insertion mutants for both WRKY3 and WRKY4 exhibited significantly more severe disease symptom and supported higher fungal growth than wild-type plants after infection by the necrotrophic fungal pathogen B. cinerea (Figure 6). Despite the similar structures of the two WRKY proteins, however, we observed no significant enhancement in the susceptibility to the fungal pathogen in the wrky3/wrky4 double mutant plants relative to the wrky3 and wrky4 single mutants (Figure 6). Thus there appeared to be little functional redundancy between the two structurally similar WRKY proteins in plant resistance to B. cinerea. We observed no major changes of the wrky3 and wrky4 single and double mutants to a virulent P. syringae strain (Figure 7), although a minor reduction in disease symptom development was observed in the wrky4 mutants in some of the experiments. On the other hand, overexpression of WRKY4 greatly reduced susceptibility to the bacterial pathogen based on strong enhancement in both bacterial growth and development of disease symptoms (Figure 7). No such enhancement in susceptibility to the bacterial pathogen was observed in transgenic WRKY3-overexpressing lines. The different phenotypes of the transgenic overexpression lines could be due to the distinct roles of the two WRKY proteins despite of their similar amino acid sequences. Alternatively, WRKY3 transcripts in the transgenic overexpression lines might not be full-length and, consequently, not functional for production of active WRKY3 proteins. Despite enhanced susceptibility of the wrky3 and wrky4 mutants to B. cinerea, we observed no increased resistance to the necrotrophic fungal pathogen in either WRKY3- or WRKY4-overexpressing lines. This might be due to the fact that the Col-0 wild-type accession, in which the transgenic overexpression lines were produced, is already quite resistant to B. cinerea (Figure 6). These results collectively indicate that WRKY3 and WRKY4 play a positive role in plant resistance to Botrytis while overexpression of, at least, WRKY4 has a strong negative effect on plant resistance to P. syringae. SA-mediated signaling pathways are important for disease resistance to P. syringae, a biotrophic or more precisely hemitrophic pathogen that rely on living plant tissue during its early stages of infection [35, 36]. On the other hand, JA/ET-mediated defense is important for plant resistance necrotrophic pathogens such as Botrytis . SA and ET/JA signaling pathways are mutually antagonistic . As a result, mutations of JA signaling regulators such as COI1 and MPK4 can enhance SA accumulation and signaling in pathogen-infected plants, resulting in elevated resistance to biotrophic and hemibiotrophic pathogens. Likewise, blocking SA accumulation can promote JA-regulated genes in Arabidopsis plants after infection by P. syringae . 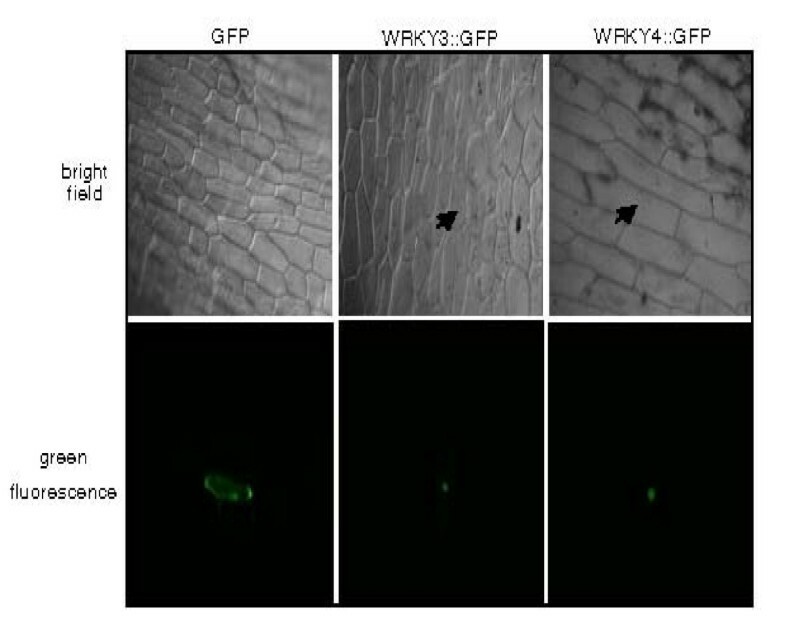 Overexpression of WRKY4 resulted in enhanced plant susceptibility to P. syringae and reduced expression of SA-regulated PR1 gene expression (Figure 7). Thus WRKY4 has a negative effect on SA-mediated signaling pathways. On the other hand, WRKY3 and WRKY4 play a positive role in JA/ET-regulated resistance to necrotrophic pathogens based on the susceptible phenotypes to Botrytis (Figure 6). These results strongly suggest that WRKY4 and perhaps WRKY3 as well regulate crosstalk between SA- and JA/ET-mediated signaling pathways and, as a result, play opposite roles in resistance to the two different types of microbial pathogens. A number of early studies of WRKY transcription factors have suggested their roles in SA-regulated defense responses. Many plant WRKY genes are induced by biotrophic patogens including avirulent P. syringae in Arabidopsis and tobacco mosaic virus (TMV) in tobacco that are known to induce SA-dependent SAR [11, 34]. A reported microarray experiment has revealed that the promoters of genes co-induced with PR1 during the development of SAR in Arabidopsis are enriched in W boxes, suggesting a critical role of WRKY transcription factors in induction of SAR-associated genes . We have previously shown that the W box sequences in the promoter of the NPR1 regulatory gene required for SA signaling are important for its expression . Intriguingly, functional analysis of individual WRKY genes has so far revealed a different picture about the roles of WRKY proteins in SA-mediated defense against biotrophic pathogens. Arabidopsis wrky7, wrky11 and wrky17 mutants are more susceptible to virulent P. syringae strains than wild-type plants [24–26] and mutations of Arabidopsis WRKY25 enhance tolerance to P. syringae . Arabidopsis WRKY18, WRKY40 and WRKY60 function partially redundantly as negative regulators in plant resistance to P. syringae and E. orontii [28, 29]. Their barley homologues HvWRKY1 and HvWRKY2 also suppress basal defense . We have also previously shown that overexpression of Arabidopsis WRKY25 and WRKY33 enhances plant susceptibility to P. syringae and suppresses pathogen-induced PR gene expression [23, 27]. Thus, these characterized WRKY proteins function as negative regulators of SA-mediated defense. 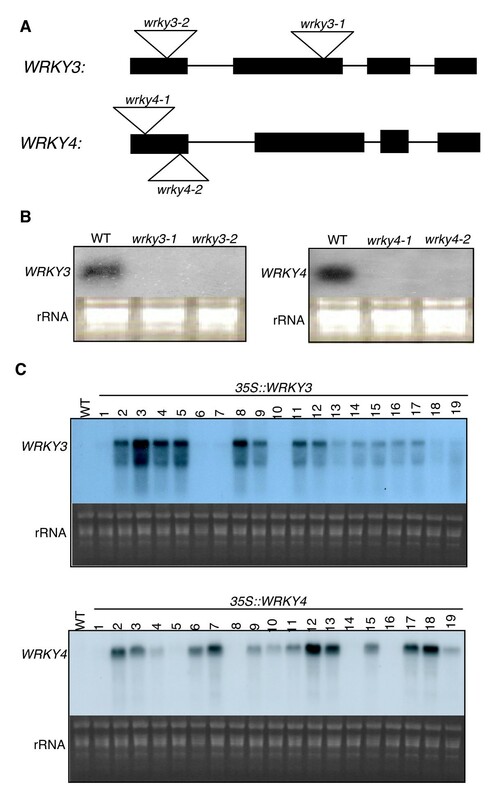 Interestingly, some of these WRKY proteins such as WRKY4, WRKY33 and redundant WRKY18, WRKY40 and WRKY60 play a positive role in plant resistance to necrotrophic pathogens [23, 28]. One exception is Arabidopsis WRKY70, which is shown to regulate the crosstalk by activating SA signaling but suppressing JA-mediated signaling [19, 20]. Intriguingly, the wrky70 mutants, which are expected to be compromised in SA signaling and active in JA signaling, responded normally to P. syringae but exhibited enhanced susceptibility to Botrytis [19–21]. Therefore, the roles of WRKY70 in plant defense signaling pathways might be complicated. Crosstalk between defense signaling pathways is an important mechanism for regulating defense mechanisms against different types of microbial pathogens. Although genes capable of regulating the crosstalk have been reported, the underlying mechanisms have not been clearly understood. Identification of a number of WRKY transcription factors that affect plant resistance in opposite ways to different types of microbial pathogens suggest that the regulation of the crosstalk between these defense signaling pathways occurs at the transcription level. For example, some of these WRKY transcription factors may regulate the crosstalk by activating expression of JA/ET-regulated genes but repressing SA-regulated genes. Such direct and opposite roles in regulation of gene expression would require these WRKY transcription factors acting as transcriptional activators or repressors in a gene-specific manner. Alternatively, the WRKY transcription factors regulate the crosstalk by activating expression of genes associated with JA/ET-mediated signaling pathways, including some encoding transcriptional repressor that suppress SA-regulated gene expression. Further studies on the transcriptional activation/repression activities and direct transcriptional targets of the WRKY proteins could generate important insights into the molecular network of complex plant defense responses to different types of microbial pathogens. 32P-dATP (>3000 Ci/mmol) was obtained from DuPont-New England Nuclear; other common chemicals were purchased from Sigma. Arabidopsis thaliana plants were grown in a growth chamber at 24°C under 100 μE·m-2·sec-1 light with 12-hr-light/12-hr-dark photoperiod. PstDC3000 were maintained on King's B medium containing 100 μg/ml of rifampicin and 50 μg/ml kanamycin. The conidiospores of B. cineria isolate B5-10 were collected from 10 days old mycelium growing on V8-agar medium and suspended in 1% maltose for inoculation as previously described . Full-length cDNAs for WRKY3 and WRKY4 were isolated from an Arabidopsis cDNA library constructed from SA-treated Arabidopsis plants as previously described . 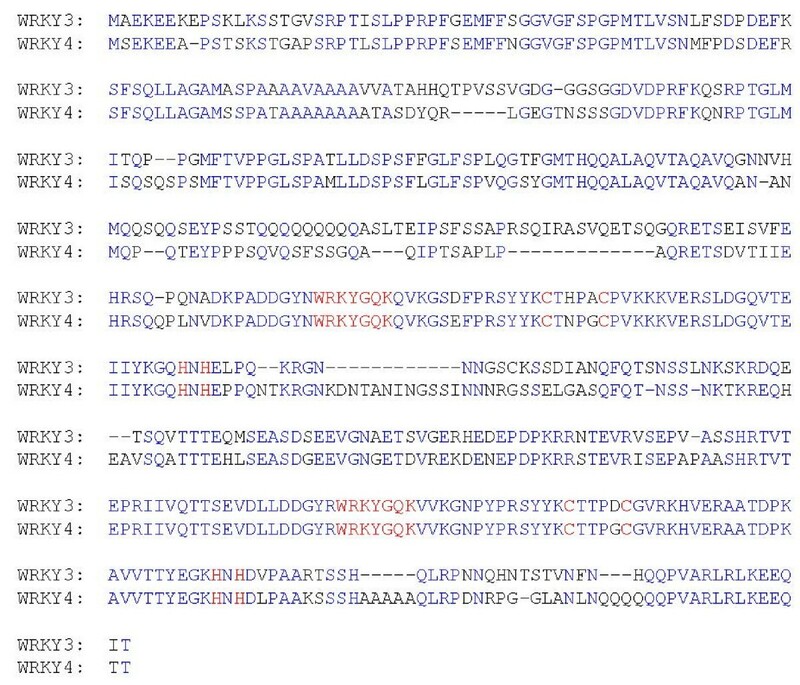 For production of recombinant WRKY3 and WRKY4 proteins, full-length WRKY3 and WRKY4 coding sequences were amplified by PCR using gene-specific primers (5'-ATCGAATTCATGGCGGAGAAGGAAGAAAAAG-3' and 5'-ATCCTCGAGCTAAGCCATGGTGATTTGCTCTTCTTTAAGCCT-3' for WRKY3 and 5'-ATCGAATTCATGTCGGAAAAGGAAGAAGCTC-3' and 5'-ATCCTCGAGCTAAGCCATGGTTGTTTGCTCTTCTTTAAGCCT-3' for WRKY4). The amplified PCR fragments were digested with EcoRI and XhoI and cloned into the same sites of the pET-32a E. coli expression vector. Preparation of recombinant proteins and DNA-binding assays were performed as previously described . Full-length WRKY3 and WRKY4 coding sequences were amplified by PCR with the same gene-specific primers used for generating expression constructs in E. coli as described above. The amplified PCR fragments were digested with EcoRI and NcoI and cloned into the same sites of a GFP fusion expression vector as previously described [23, 25]. Onion epidermal cell layers were peeled and placed inside up on the MS plates. Plasmid DNAs of appropriate fusion genes (0.5 μg) were introduced to the onion cells using a pneumatic particle gun (PDS 1000, Du Pont). The condition of bombardment was vacuum of 28 inch Hg, helium pressure of 1100 or 1300 psi, and 6 cm of target distance using 1.1 μm of tungsten microcarriers. After bombardment, tissues were incubated on the MS plates for 24 h at 22°C. Samples were observed directly or transferred to glass slides. The wrky3-1 mutant (Salk_107019) contains a T-DNA insertion in the second exon while wrky3-2 (Salk_119051) contains a T-DNAinsertion in the first exon of the WRKY3 gene (Figure 5A). The wrky4-1 (Salk_082016) and wrky4-2 (Salk_073118) mutants both contain a T-DNA insertion in the first exon of the WRKY4 gene. T-DNA insertions were confirmed by PCR using a combination of a T-DNA border primer (5'-GCTTGCTGCAACTCTCTCAG-3') and a gene specific primer (5'-GCTTCATTGACTGAGATTCCATC-3', 5'-CCCGGTGGTTGAGTTATCAT-3', 5'-TCATCGGAATCAGGGAACAT-3' and 5'-TCATCGGAATCAGGGAACAT-3' for wrky3-1, wrky3-2, wrky4-1, and wrky4-2, respectively). The nature and location of the T-DNA insertion was confirmed by sequencing the PCR products. Homozygous T-DNA mutant plants were identified by PCR using primers corresponding to sequences flanking the T-DNA insertion sites (the above four gene-specific primers paired with 5'-ATTCCCAACCTCCTCGCTAT-3' for wrky3-1, 5'-GAGAAACACGACACGAATTTTG-3' for wrky3-2, 5'-AAACACGACACGGATTCACA-3' for wrky4-1 and wrky4-2, respectively). To remove additional T-DNA loci or mutations from the mutants, we backcrossed them to wild-type plants and identified plants homozygous for the T-DNA insertion. Full-length WRKY3 and WRKY4 cDNAs were excised from the cloning vectors using BamHI and XhoI and subcloned into the BamHI and SalI sites behind the CaMV 35S promoter in pOCA30 [23, 25]. Arabidopsis transformation was performed by the flora-dip procedure  and transformants were identified by screening for kanamycin resistance. From the transformants, those with a single copy of T-DNA insertion (based on the 3:1 segregation of antibiotic resistance in T2 progeny) were isolated and homozygote transgenic plants were further identified in the T3 generation based on the segregation in antibiotic resistance. For RNA gel blot analysis, total RNA was extracted with Trizol reagent (Invitrogen) from leaf tissue, separated on 1.2% agarose-formaldehyde gels and blotted to nylon membranes according to standard procedures. Blots were hybridized with – 32P-dATP-labeled gene-specific probes. Hybridization in PerfectHyb™ Plus hybridization buffer (Sigma) at 68°C and subsequent membrane washing were performed as previously described. Full-length cDNAs were used as probes in Northern blotting for detecting WRKY3 and WRKY4 transcripts. Arabidopsis PR1 gene probe was generated from a PR1 DNA fragment amplified by PCR using two PR1-specific primers (5'-TTCTTCCCTCGAAAGCTCAA-3' and 5'-CGTTCACATAATTCCCACGA-3'). The B. cinerea ActinA gene probe  was amplified from the B. cinerea genomic DNA and by PCR using primers 5'-ACTCATATGTTGGAGATGAAGCGCA-3' and 5'-TGTTACCATACAAATCCTTACGGACA-3'. For disease resistance to P. syringae, three mature leaves of each 5-weeks old plant were infiltrated with a virulent strain (OD600 = 0.0001 in 10 mM MgCl2). The bacterial titers were determined immediately after infiltration or after 3 days post-inoculation for bacteria growth analysis. For disease resistance to B. cineria, the fungal spores (5 × 105 spores/ml) were sprayed on 35 day-old plants evenly. The plants were covered with transparent plastic dome to maintain high humidity and disease development was evaluated 5 days later. Zhibing Lai, KM Vinod contributed equally to this work. We thank the ABRC at the Ohio State University (Columbus, OH) for the Arabidopsis mutants. This work was supported by National Science Foundation Grant MCB-0209819. This is Journal Paper 2008-18311 of the Purdue University Agricultural Research Program. ZL carried out expression analysis of the WRKY genes and analysis of the mutants and overexpression lines. KMV carried out DNA binding assays, determination of subcellular localization, isolation, generation and characterization of the mutants and transgenic overexpression lines. ZZ carried out Botrytis tests. BF carried out isolation of the cDNA clones. ZC conceived of the study, participated in the design and helped to draft and edit the manuscript. All authors read and approved the final manuscript.